Jeffrey H. Loria & Co., Inc., New York. Acquired from the above by the present owners, 21 December 1998. 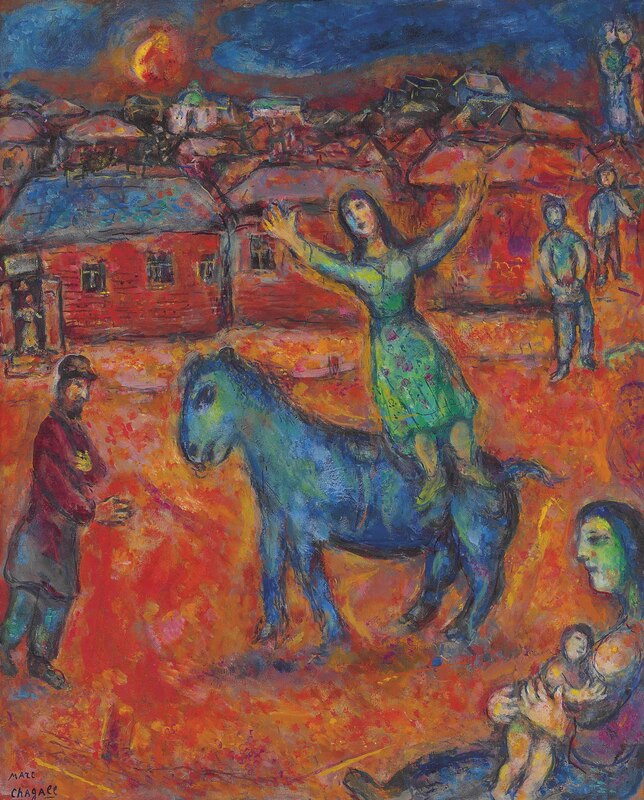 The wondrous vitality of Chagall's imagination, as youthfully whimsical and impetuous as ever, empowered him in his late paintings to become--like Picasso, notwithstanding the strong differences in their backgrounds and temperament--the impresario, auteur, director and a leading player in a lively theater of memory. Just as Picasso drew heavily on his ancestral Mediterranean roots, so Chagall became the artificer of a pictorial realm based on multiple personal mythologies he had evolved for himself as the proverbial Wandering Jew. He assembled during his migrations and occasional travels a diverse iconography that evoked his early years in Russia, his love of Paris and the French countryside, a wartime transatlantic exile in America, and then again France, where finally he made his home by the Mediterranean, not far from Picasso. Eager to observe, first hand, current conditions in his ancestral homeland, at a time when Cold War tensions were still simmering, Chagall decided to visit Chairman Brezhnev's Soviet Union. He journeyed to Moscow in June 1973. This visit was the first time--and sadly, too, the last--he set foot on Russian soil since he had left behind in 1922 the chaos and privations of the post-revolutionary period. Aptly titled Au village rouge, the present painting was executed soon after Chagall was back home in Les Collines, his residence in Vence. The red village in the background is old, pre-revolutionary Vitebsk, the cradle of the artist's birth, childhood and early manhood--indeed, his very beginnings as an artist. Chagall's feelings of self-identity drew strength from this potent sense of place, signifying his Russian-ness, his beginnings as a child of the shtetl and a denizen of the Jewish Pale. During his 1973 trip, however, he declined to visit the town. "There are memories one should not disturb," he explained. "I have not seen Vitebsk for sixty years. What I should see there today would be incomprehensible to me. That which forms one of the living elements in my paintings would prove to be non-existent" (quoted in J. Wullschlager, Chagall: A Biography, New York, 2008, p. 513). The image of a mother and child at lower right in Au village rouge also suggests these origins. She is Mother Russia; Chagall is the child at her breast. Taking inspiration from the powerful tradition of Russian icons, Chagall first painted his own Madonna and Child in 1911 (Meyer, no. 129). He made the mother and child his most tragic symbol of the helpless, innocent victims of total war in those cataclysmic scenes of the shtetl set ablaze he painted as an exile in America during the Second World War. The primary, front-and-center image in the present painting is, of course, the horse and young female rider, which Chagall has cast as a variant of the circus, which became the prevailing and favorite theme among the artist's personal mythologies in his late work. He found in his vision and dream of the circus world the ultimate metaphor for that life of an artist he had decided to pursue, filled with--as fortune would decree--the joy of romance and the excitement of skillful bravado, which nevertheless remained the struggle for a livelihood, a risky existence which might result in the reward of public acclaim, or the lonely disappointment of obscurity and failure. This scene is by no means, however, the colorful spectacle of the fabled Cirque Médrano of Paris, or even the more modest entertainment provided by an itinerant troupe of saltimbanques in Montmartre. We bear witness instead to the implausible performance of a local village girl clad in everyday dress atop a dray horse, attracting an audience of peasants and workers from the humble wooden huts of a shtetl on the vast dark and stormy steppes of Russia. Chagall has probably inserted himself as the horse arrayed in the melancholy blueness of a dream. The redness of the setting is, by contrast, also the color of passion: the girl who has surmounted him is his heart's desire, in the figure of his beloved first wife Bella, who died in 1944, but remained his eternal bride and forever the light of his life. Please note the correct medium is oil, sawdust and pastel on canvas.